(Bloomberg) -- Mutual-fund giant Vanguard Group Inc. is opting for a limited addition of Chinese domestic bonds to its portfolios, stopping short of the inclusion plans for one of the benchmark indexes for global debt. Vanguard, which uses Bloomberg Barclays indexes for its funds, sees diversification benefits from adding China, the company said in an emailed response to questions. Yet the challenge for bond-index trackers is to avoid incurring high transaction costs -- which would introduce divergence from index performance -- in a market with less liquidity, such as China. Vanguard plans a 0.2 percent to 0.5 percent allocation to China bonds for its global and international fixed income index portfolios, the company said. That will take effect next month. Bloomberg Barclays plans to boost the China weighting to about 6 percent, in even monthly increments, from April 2019 to November 2020. 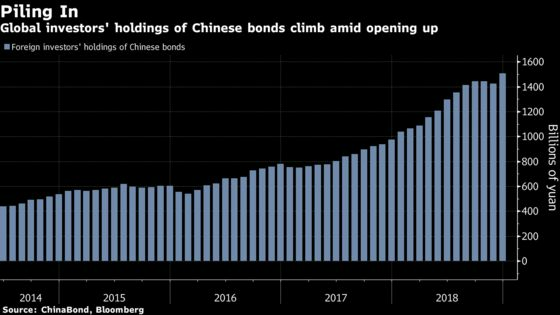 China has already enjoyed record inflows into its near-$13 trillion bond market, though most of the influx has come from central banks and sovereign wealth funds. Private-sector fund managers have had varying plans, with some sharing the kinds of concerns Vanguard cites. “I can’t say I’m committed one way or another, but for sure everybody’s got to start putting them into their process and looking at them,” Bob Michele, chief investment officer for global fixed income at JPMorgan Asset Management, said last month of Chinese domestic bonds. Bloomberg LP owns Bloomberg Barclays indexes, and Bloomberg News.